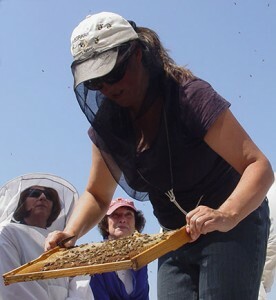 offer best practice advice to the beekeeping community. Kentucky State Apiarist, Tammy Horn Potter at the 2014 Eastern Apicultural Society of North America conference. Photo credit: Ray Tucker, Jr.
Tammy Horn Potter grew up on a farm, but was determined never to do science, agriculture or math when she went to college. An English professor by training, Potter decided to help her grandfather with his bees in 1997 and immediately became smitten with them. Balancing her career as an English professor and hobbyist, Potter wrote Bees in America: How the Honey Bee Shaped a Nation, which was published by University Press of KY in 2005. Potter followed Bees in America with a second book, Beeconomy: What Women and Bees teach us about Local Trade and Global Markets in 2012. In order to write it, she went to Hawai’i during off-seasons from 2006-2010 to work in the queen bee production industry. As the 2006 National Endowment of Humanities Chair of Appalachian Studies at Berea College, Potter focused on large scale surface mining reclamation and specifically how it affected pollinators. From 2007-2014, with a generous grant from Ed and Elaine Holcombe, she started Coal Country Beeworks (based at Eastern Kentucky University), which worked with community partners to offer workshops, education, and practical beekeeping skills in Eastern KY. In addition to working with coal companies to get more pollinator habitat included in reclamation, the KY State legislature approved legislation that would let coal companies modify their reclamation with pollinator habitat: www.lrc.ky.gov/record/10rs/hb175.htm. Another law was also passed in 2010 that allowed Dept of Transportation to include more habitat on highway rights-of-way: www.lrc.ky.gov/record/10RS/SJ177.ht. In 2014, Potter became the KY State Apiarist. Her primary goals as apiarist are to document hive health, promote economic development, and provide education and outreach. To date, she has partnered on a USDA grant to promote pollinator and cerulean habitat in Eastern KY, a USDA-APHIS Honey Bee Health Survey grant, and implemented a Hive Count/Honey Report system for the state. Horn has served as president for KY State Beekeepers Association, president of Eastern Apiculture Society, a director on Foundation for the Preservation of Honey Bees, and been awarded the 2010 North American Pollinator Protection Advocate Award as well as the Kentucky State Beekeeping Association Lifetime Achievement Award and KSBA Beekeeper of the Year.